Almost every person that calls themselves productive has a morning routine that helps to start the day with the energy needed to accomplish everything. For example, the founder of Virgin Group Richard Branson begins his working day with the morning run because it refreshes him and gives the energy. Starbucks president Michelle Gass wakes up until 5 am to start the morning run due to these very reasons as well. Vogue chief editor Anna Wintour visits the tennis court before 6 am to be in time for work. This list can be continued with many other famous entrepreneurs and talented people who accomplished many things in their life and shared one important condition: a proper start of the day. Whether it is a morning run, tennis game, or several simple physical exercises, the potential to providing the energy needed for the day is immense. The difference between the exercises is explained by the fact that each of is unique and everyone has a personal rhythm that should be followed. 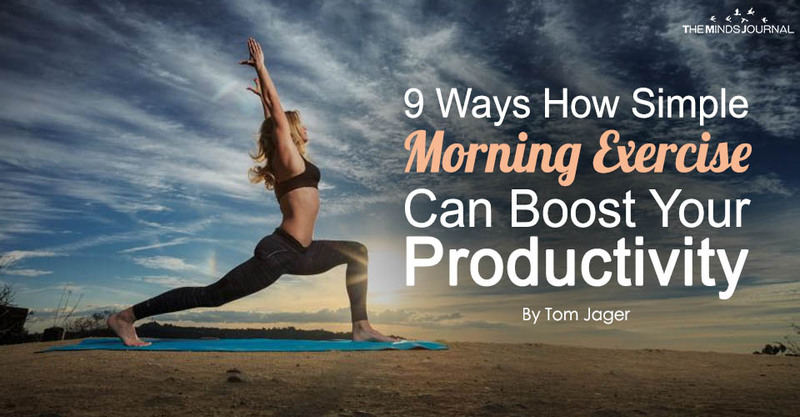 There are many reasons why morning exercises can boost the productivity and we will get to them shortly, but first let’s discover whether you consider yourself as a morning person. Do not dismiss the power of morning exercises just because you are not! The truth is, the essence of these exercises lies within your desire to be productive and you do not actually have to wake up at 4 am. Moreover, after a while, you will develop a morning routine that will work for you and make it much easier to start the day in a proper way. People who are used to performing morning exercises actually say that the first time is the most difficult one but everything tunes out in no time. Here are nine reasons why simple morning exercise can enhance your productivity for an entire day and also improve your health. Let us get a little bit scientific to explain this reason. According to many scientific studies, physical exercises are one of the perfect ways to increase the blood flow to the brain, which has a lot of positive outcomes. They include improved mental sharpness, which contributes to better time management, decision making, and engagement. These positive results have been already acknowledged by many companies; in fact, some of them that offer leadership development programs instruct the participants to begin the day with an exercise, such as strength training or yoga. The results from the morning exercises do not require waiting for a long time to develop. Just a few days are actually needed to see how your focus and engagement is changing to become more sharp and efficient. Eventually, the productivity will also be boosted. The last thing that comes to mind of many people in the morning or after a long working day is exercise. It sounds counterproductive because getting rest seems like the obvious choice when you came home from work or woke up to go to the office as soon as you can. In fact, getting exercise, whether in the morning or in the evening is actually a productive thing because it can give you the boost of energy you need to continue your day. Imagine you woke up early and have to leave for work in two hours. It is very likely that what comes to your mind in times like these is “where do I get the energy to go to work? I’d rather sleep for another hour.” That’s just one way to go about it and not the smartest one because exercising actually wakes up the energy inside you by enhancing the ability to transfer glucose and oxygen throughout the body and brain (again, scientifically supported fact). Even walking and other low-intensity exercises can work just as great as running and strength training to boost your energy and, ultimately, productivity. The most important asset of every knowledge employee is the brain. It is what helps to perform complex calculations and complete marketing reports, so it has to alert and sharp as possible to produce the best results. According to a recent study by the Body-Brain Performance Institute, the participants that performed an assigned set of physical exercises every morning have experienced lower levels of stress and better brain function at work. On the other hand, those who did not engage in the exercises reported quite the opposite: elevated stress levels and slightly lower productivity. The study concluded about the apparent connection between the physical fitness and brain functioning and the importance of understanding it to achieve better productivity. Evidently, the morning exercises can boost the performance because they improve the mood and cognition from the very start of the day, which prevents from experiencing higher levels of stress and helping to concentrate on the work. A concentrated brain is the guarantee of better decisions, effectiveness, and efficiency. Does this happen to you? You try to solve some problem or perform some task but the brain just refuses to work, causing you to be stuck for hours. You leave it unsolved and then try to complete it in the morning, and the brain is surprisingly active and the problem gets solved in a matter of minutes? If it does, morning exercises are supposed to be great for you. If you get stuck some with some task that requires a lot of thought but the ideas just do not come to mind, leave it for the morning. When you wake up then, try to engage in some exercise and you will see how fresh ideas begin to emerge one by one. Even a walk around the neighborhood is fine for that. The freshness of the morning and the sharp brain will help you to come up with great solutions. If you need some creativity on the job, this is a very good idea. Physical exercises can be intense. Let’s face it, some of them require to do the best you can, even if it means running despite feeling tired and exhausted. These moments can be really uncomfortable but they also have one great benefit that is now widely advertised. They teach how to continue to work even when you experience discomfort and prefer to stop, which is exactly what happens at work. When you work, you may be faced with a lot of roles and responsibilities, which can bring a fair amount of discomfort to the day. However, despite how uncomfortable you are performing them, you keep going, just like during the exercises, when you are so tired but do one more lap to push yourself to the limit. Exercises can be a good teacher of patience because they train to work through discomfort and achieve what is required. If you want to exclude the morning workout from your everyday routine to find an optimal balance between work and life, think again. Numerous studies showed that people who succeeded in performing regular morning workouts had fewer issues in achieving the best work-life balance. One of them suggests that the main reason behind this success was the structured activities that allowed to develop better time management skills. As the result, the people became more confident in their abilities to meet the needs of both professional and personal lives. Sticking to the schedule regardless of the circumstances and leaving morning workouts in place may be a tough task to do, but in the end, it all pays off with great benefits. Always wanted to learn those time management skills? Believe it or not, exercise is the way to go. It is a known fact that morning exercises can improve the health, which is also needed to be better at what you do. Science says that critical body hormones that help to build the muscles and strength are elevated during the early hours of the day, so this is a perfect time to exercise. Given that their levels are lower during the day and in the evening, morning is the best for that. Moreover, even simple exercise can increase your metabolic rate. Shortly put, morning workout is a great way to start the day healthy and continue with the great energy and mood. More importantly, the regular schedule will contribute to overall health and strength. According to the life coaches, morning exercise is one of the best ways to get a better sleep that will provide total refreshment. It has also been proven to be effective in insomnia patients! Getting up in the morning to do the exercises actually increases your active hours, so you are most likely to spend all your energy during the day. As the result, you will be pretty tired by the time the evening comes, so sleeping patterns will be improved. Moreover, the quality of sleep improves as well because you experience more ‘deep’ sleep and rebuild the energy. Poor sleep does not do any good to being productive but good sleep does. Given that morning exercise is a key to good sleep, trying them may be the last thing you need to improve your sleep sessions.